Hello and welcome to yet another one of my Ring Of Honor TV reviews as we continue to make a dent in the year that is 2016. I am of course Nathan, and this episode was a lot better than last week's and we now know who the 2016 Top Prospect Winner is, but we will get to that later. The commentary for the week was once again Kevin Kelly as Mr. Wrestling 3 joined him, as they would call all of the action for the entire hour. The show opened with a pre taped drug induced promo from Dalton Castle talking about his feud with Silas Young and what's to come for the both of them. From there, we head to the ring for the first match of the night, which happens to be the finals of the 2016 Top Prospect Tournament. The match begins and Brian Fury begins by manhandling his much smaller opponent in Lio Rush. Fury muscles Rush over with a hip throw. Fury goes for a clothesline, but Rush does a matrix maneuver to avoid getting hit and hits an Enziguri on Fury. Fury rolls to the outside of the ring before getting hit with a vaulting body splash from Lio Rush. Fury barely is fazed by the move and he shakes off the damage briefly before throwing Rush into the barricade before we head to a commercial. Back from commercial and Fury catches Rush in the face with a back elbow for a near fall. Lio recovers and hits a tornado DDT for a near fall of his own. Both men get to a vertical base and Lio ends up on Fury's back, but Fury falls backwards. Lio recovers and climbs to the top rope to hit a frog splash for a near fall. Fury reverses a hurricanrana attempt from Rush and rolls him up for a near fall while grabbing the ropes, but Todd Sinclair sees it and kicks Fury's hand off of the rope to allow Lio to pick up a near fall. Both men are back to their feet for a reset, Lio Rush hits Rush Hour before pinning Brian Fury to become the 2016 Top Prospect Tournament winner. Very fun conclusion to the 2016 Top Prospect Tournament and even though Fury managed to lose, he will still make some great waves in ROH going forward. I can't wait to see how both of these guys progress in the company. From there, we go to the next match of the night. The two men begin by trading punches in the center of the ring, the action spills to the outside of the ring where Moose throws Kongo into the barricade. Back in the ring, Moose runs over Kongo and Kevin Kelly says it's like "Getting hit with a refrigerator", which I've never been hit with in my life so I'm not sure where that analogy came from but I digress. Kongo hits an awkward looking splash on Moose for a near fall but Moose kicks out. Kongo continues the offense and hits a Pounce on Moose to pick up another near fall. Moose comes back and hits the flipping spear to pick up the win via pinfall. The move looked awkward this time around because Kongo was too big to take the move properly. This match wasn't bad for what it was, but it wasn't long enough to really get going, just a way to build some momentum for Moose. From there, we flash back to two weeks ago when Veda Scott wanted Jonathan Gresham to give up his TV Title shot, but he didn't do it. We then go to the next match of the night. This wasn't a match at all, but just a way for BJ Whitmer to attack Page and continue their storyline although I'm not quite sure where it's headed. After the scuffle between Page and Whitmer, Page says things aren't over between himself and Whitmer. From there we head into the main event of the evening, but not before Silas Young makes his presence felt on commentary. The match starts with the feeling out process, which takes a few minutes. They stare at each other and in a pure comedic spot, both try and do the Matrix maneuver but while Castle is successful in his attempt Daniels manages to fall over in a fun spot that really didn't add anything to the match, but it didn't hurt it either. Dalton gets the first real offensive maneuver by hitting a gut wrench suplex on Daniels. The two make their way to the outside of the ring where Daniels pushes Castle into the barricade after Castle missed an attempt at a hurricanrana on the outside. Daniels locks on a waist lock on Castle as we head to a commercial. Back from commercial and Castle catches Daniels coming off of the top rope before slamming him down to the mat. Castle hits the slow motion German suplex but Daniels manages to kick out of it. Castle hits his rebound hurricanrana and goes for a bang a rang, but Daniels reverses it before hitting Angels wings to score the pinfall victory. Match Result: Christopher Daniels defeats Dalton Castle via pinfall after hitting Angel's wings. After the match Dalton gets a microphone and tells everyone how fabulous he is even in his loss, and Dalton then goes on to say that he feels on the inside the way that Silas Young's face looks on the outside. He finishes saying that he wants Silas Young in a Fight Without Honor before we fade to black for the week. Four matches again this week, but really three considering that one was only used to further a storyline. The Top Prospect Tournament finals were excellent and was definitely the take away from the hour. And that'll do it for me and another one of my ROH reviews for, thanks to everyone for reading and make sure to follow me on twitter @Headliner5 and lets talk some wrestling. 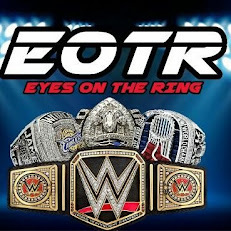 Also be sure to follow both @EyesOnTheRing as well as @4CRadio for some great wrestling content. I will see you right back here next week for another review.